all materials included | all levels are welcome! We are excited to partner with the Chattanooga Chapter of the French American Chamber of Commerce on this special workshop. The Chamber is part of a network of 113 French Chambers in 83 countries. Their role is to promote and facilitate exchanges between French and American organizations, companies and entrepreneurs like Alice-Anne Augustin by helping them to promote their products, services, and talents in both countries. 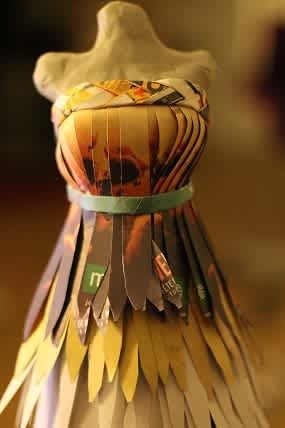 In this one and a half day workshop, participants will learn how to create a paper dress using several techniques of cutting, folding, and color selection from newspaper. They will have a demonstration and guidance for the creation of paper beads, feathers, various patterns, and will be able to be innovative to create their own designs. The workshop will begin with a basic sketch of the dress that participants have in mind to guide their creative process. 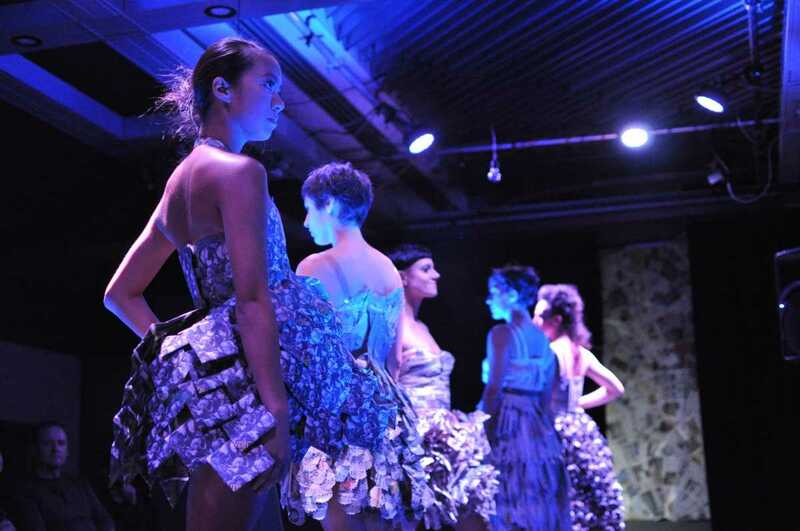 Participants will then build the basic structure of their dress with an assembly of folded strips. The filling technique will vary because each participant will be able to choose what they want to develop as a motif on the dresses. Some might bring their sewing machine if they already know how to sew, but it’s just an option. 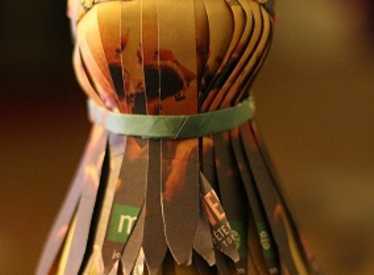 Some may open the paper to make a kind of personalized lace. If some participants have paper-craft punches, they are welcome to bring them. Mannequin dress form (24 inches height) will be provided and participants will get to keep it. All basic material will be provided, (newsprint, glue, scissors, scalpels, etc). 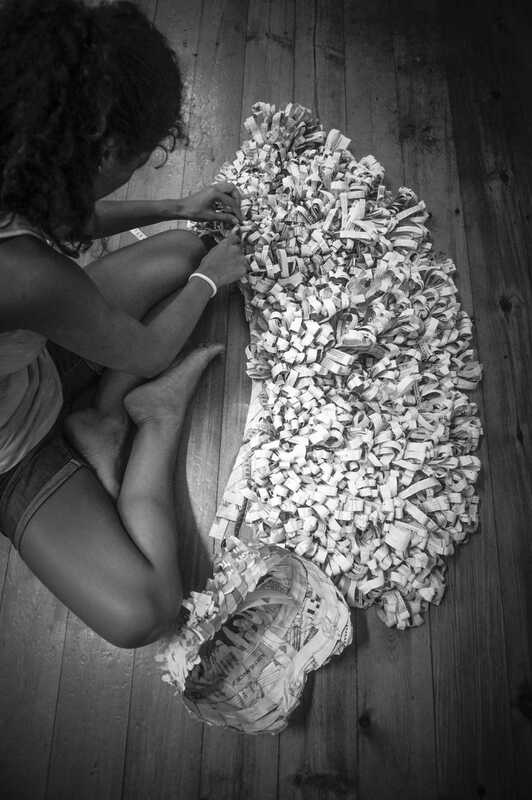 Alice-Anne Augustin, is a master at designing dresses from newspaper. With the creation of her dresses, she wants to denounce the excessive flow of information that disconnects people from real life. She has a real artistic approach that emerges from her creations. She started from the observation that we are overwhelmed by information coming from all over the place and multiplying like tablets, phones, and computers and she decided to counter this phenomenon of disconnection. For her, people are living more and more outside of reality because of these communication mediums. She then decided to use newspapers to divert this flow of information as you will see during her workshop. Alice-Ann studied art in Bordeaux and communication in Montreal where she currently resides.